The Burgess Animal Book For Children in "A Fellow With A Thousand Spears"
Happy Jack in "Happy Jack Finds A New Home"
Pony Twinkleheels in "Picking Currants"
The Adventures Of Lightfoot The Deer in "The Hunter Lies In Wait"
Whitefoot The Wood Mouse in "Whitefoot The Wood Mouse Is Unhappy"
Hansel and Gretel is an old fairy tale by the Grimm Brothers about two children who are abandoned in a forest by their parents. 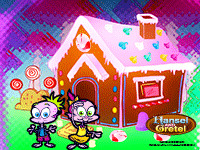 Read it here at KIDOONS and find out how the kids eventually find a gingerbread house! And a witch as well, oh no!